Every Gen Con I try and attend at least one event that you can only play at a large convention like Gen Con. 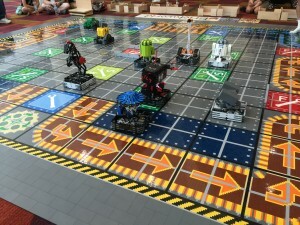 This year I tried my hand a Super Robo Rally by Team Hassenplug. 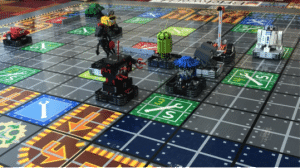 This game is based on the popular RoboRally board game except the game is played out by actual 1ft tall Lego Mindstorms robots. Each player programs their robots commands on an Android cell phone using a custom user interface that not only submits you decisions but also displays scoring and Bot status. 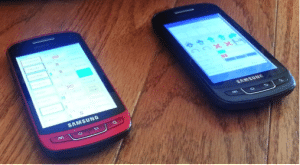 The phone uploads the player decisions to a central computer which then calculates the turn and orchestrates the robots movement. I chose to play the entry level ½ hour scenario since I had never played RoboRally before. 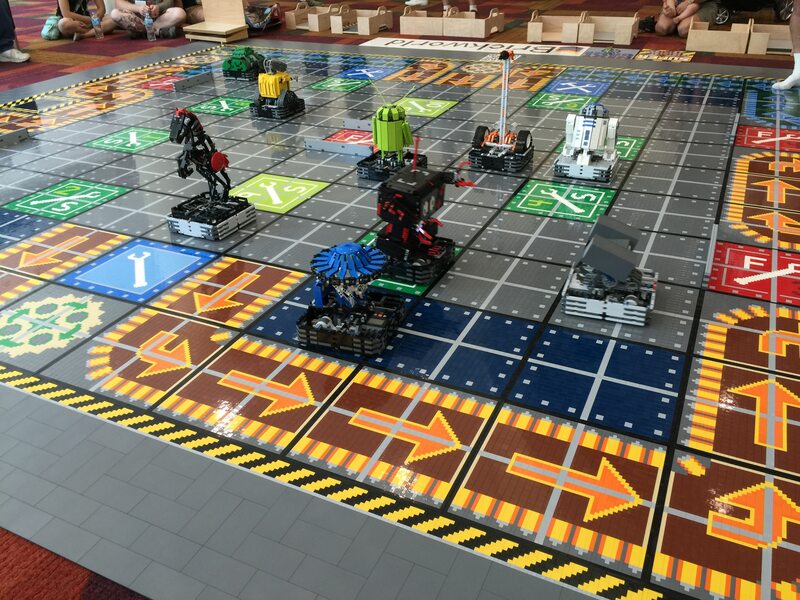 The scenario was a king of the hill game where the bots push and shove to occupy one of the red squares on the board with the central red square being worth the most victory points. Regular RoboRally involves the bots shooting weapons at each other this scenario did not include those rules but the system was setup to include weaponry in other scenarios. I played Twitch the tall orange robot. In the first turn as predicted several bots made their play for the central square me included. The programming choices of several players were fouled early on by pushing during the round of five moves, but my bot ended the first turn in a good position to start scoring in turn two. In the final I managed to score twice more in the center square but R2 and the green tank shove me back and forth in a battle for the center. 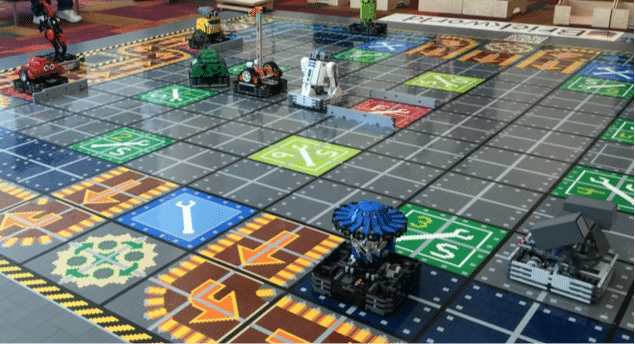 In the final moves the Android bot joined the line only to be pushed into the pit at the far end of the play field. In the end I scored enough points to finish second to the R2 Bot. Short of a couple of technical difficulties with the bots this was a great event and I would not hesitate to recommend it to a gamer of any level. It was great programming your strategy and seeing it played out in real time. As an engineer I was very impressed with all the work done to build and program this experience. David Gish liked this on Facebook.